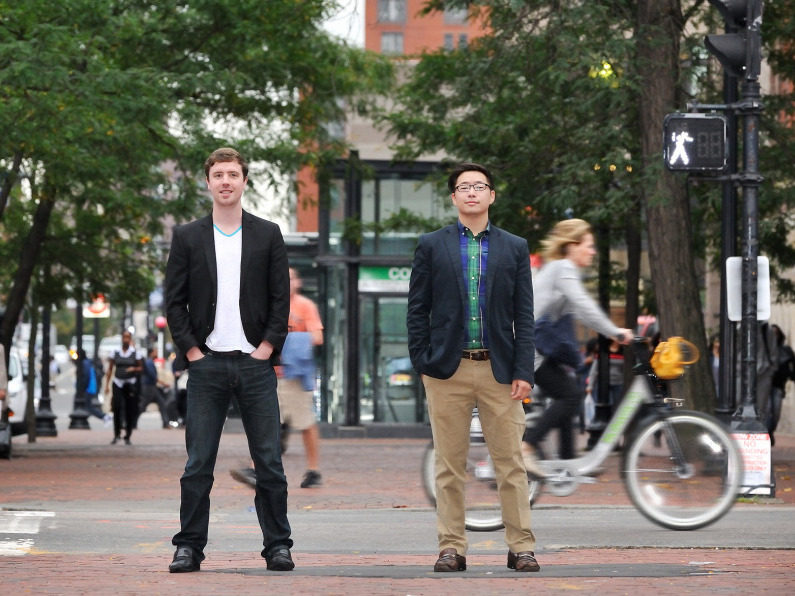 ©2015 Jon Chomitz PhotographyPlastiq founders Eliot Buchanan and Dan Choi. Payment app Plastiq enables users to pay for nearly anything – including bills – with a credit card, but charges a 2.5% fee. Plastiq may be worth it if you’re trying to accumulate points or meet a minimum spend on a new credit card, but if you’re not careful, the fees could outweigh the rewards. Plastiq has an A+ rating from the Better Business Bureau and it’s simple to use. Move over Venmo and Apple Pay – there’s a new payment app in town and it’s called Plastiq. That’s right, Plastiq allows you to pay for anything with a credit card, including mortgages, rent, tuition, auto loans, utilities, and even taxes. Buchanan and Dan Choi, both Harvard grads, founded Plastiq in 2012. In May 2018 the company raised $US27 million in its largest funding round to date. Plastiq has an A+ rating from the Better Business Bureau and the app is simple to use. Just add your credit card information, then enter details about the recipient (an individual or company) and the amount you’re paying. Plastiq charges the credit card on file and delivers the money to the merchant by your choice of check, wire transfer, or automated-clearinghouse transfer. If it sounds too good to be true, it might be if you consider the 2.5% fee Plastiq charges for each credit-card transaction. However, the app occasionally runs promotions for lower rates (like a recent 1.5% promotion for Mastercard payments of at least $US500), and there are other benefits that may make the fee worth it. If you’re a savvy credit card user who loves to play the rewards game, Plastiq can be a great tool when it comes to racking up points. Travel hacker Keith Rosso purchased a Tesla Model 3 for $US58,857 using his Chase Ink Business Preferred card through Plastiq. This move earned him 180,000 Chase rewards points, equal to $US1,800 in cash back or at least $US5,000 in airfare, hotels, or car rentals. If he chose cash back, he’d only get $US330 in profit after accounting for the Plastiq fee, but he can get more value through Chase’s travel partners, using the points for seven nights at the Park Hyatt Maldives or a round-trip business-class award flight on United. Credit card experts agree that Plastiq might be useful for someone trying to meet a minimum spend on a new credit card to earn a sign-on bonus. Holly Johnson of The Simple Dollar wrote that it only makes sense to pay bills with Plastiq when you need to hit a minimum spending requirement, when you’re trying reach a spending limit to earn status, and when the rewards you earn are more valuable than the fee. But you should still take pause when considering Plastiq just to quickly rack up points. Dan Miller of the blog Points with a Crew told CreditCards.com that points are generally worth $US0.01 to $US0.02 cents each, depending on the deal. So if you’re paying $US.025 per point, you may have a hard time getting enough value even for an ongoing basis. If you’re not careful, your fees could end up exceeding the rewards you earn. Blogger Miguel Quinones at The Frugal Travel Guy can’t justify using Plastiq if fees are above 2%, although he makes an exception when he’s trying to meet a minimum spend requirement for a sign-on bonus. But points aren’t the only benefit of Plastiq. Allan Backman, education manager for the Association of Certified Fraud Examiners in Austin, Texas, told CreditCards.com that Plastiq could also be helpful when a bill is due before you have the money to pay it. Because Plastiq charges your credit card, it’s a way of stalling the ultimate payment and buying yourself some time, he said. Still, you should only do that if you’re sure you will have the cash by the time your credit card bill is due. Plastiq also offers easier budget tracking, purchase protection, and may help you keep your debit and bank account information safe from hackers. As with any new payment app – or anything you connect private information to – you may be wondering if Plastiq is safe. It’s natural to be wary of entrusting your credit card info to a start-up, but Plastiq told CreditCards.com that their safety precautions exceed safety standards set by the credit card industry. Likewise, Miller reported no safety issues using Plastiq and Quinones wrote that he found the app trustworthy. The bottom line is to use the app cautiously, budgeting for extra fees and keeping an eye on your personal info.